We’ve made it to the third installment in “Attack of Cheap Whiskies.” This time around, we’re sampling Wild Turkey 81. I’ve got the 81 hanging around so folks understand that I am *not* talking about Wild Turkey 101. I nabbed this bottle at the shop for about $18. This is not Jimmy Russell’s Wild Turkey. This bottle is the brainchild of Eddie Russell, Jimmy’s son. It’s a blend of different aged barrels, none less than 6 years old; aged in their famous alligator char barrels. Wild Turkey 81 deserves not only your attention, but a spot in your home bar. I’m seriously pleased that this is the second bottle of cheap stuff that I really like. I was pleasantly surprised the first time I had it. Folks I’ve shared it with have had similar reactions. Wild Turkey 81 is a really good twenty-ish buck Bourbon. The scents that rise from the glass are classic Bourbon: caramel, vanilla, baking spices, toasted nuts. The alligator barrel char isn’t the first thing you’ll smell… maybe not even the second or third, but at some point, you’ll notice a mellow smokiness. Personally, I dig it. The flavors here are well presented. Your standard caramel, toffee, and toasted nuts are present with a mild pinch of orange peel. I frequently flip-flop on my like/dislike of high-rye bourbons. As a high-rye whiskey, Wild Turkey 81 isn’t overly peppery. Sure, there is a twinge of pepper, but it’s not a heavy burn. The finish is long, sweet, and smooth. The toffee/caramel sweetness sticks around after the whiskey has traveled down your throat. It’s not velvety, nor viscous, but the finish is good. And no real whiskey bite. 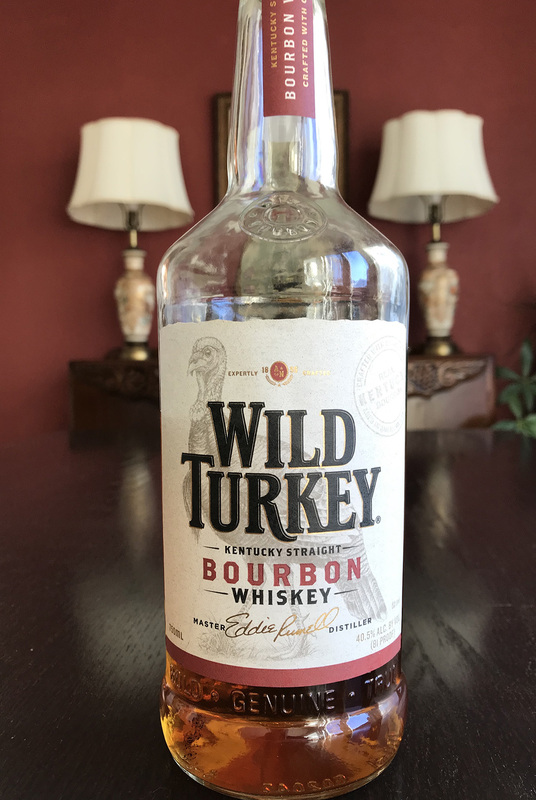 If it was Eddie’s intent to make a Bourbon that would work well in cocktails, I think Wild Turkey 81 is solid try. Personally, I’d have ramped it up to 88 to 92 proof for cocktails. Still, on its own, this stuff is solid. Nice lip tingling action going on here. Will I be poisoning my body with more Wild Turkey 81? Yes.